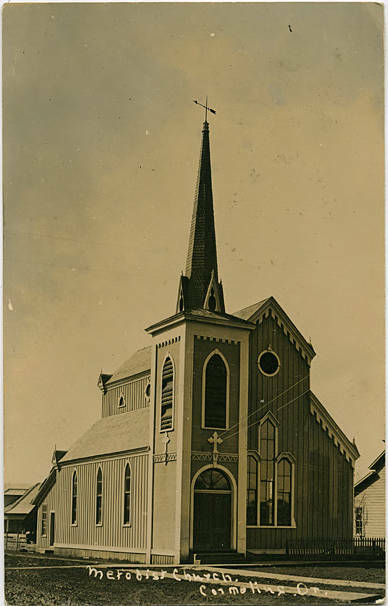 Black and white image of a Carpenter Gothic church. The center section extends above two sides, which function as buttresses. Pointed arched windows are placed along the side, with a triple window in the front of the church. Small round windows line the visible wall above the side section roof, and carved bargeboards decorate the edges of the roof. A large, square tower dominates the forward corner of the building, featuring a rounded arch window above a wide doorway and culminating in a tall, narrow 8-sided steeple. Decorative woodwork adorns the tower, including two carved crosses. The main building and church tower still stand at the corner of 11th and Beech streets, though the upper portion of the main building has been removed, as has the tall steeple. A one cent stamp is affixed to the back of the postcard. [front] [white ink] Methodist Church, Cornelius, Or. [back] [pen] Miss Alma Long, 228 20st. N., Portland, Oregon. Hello girls - We are all O. K. Hope you are find and dandy. Momma hasn't had time to write. Have my teeth all out some job. Look for you out soon. Megaries were out Sunday. Stayed all day. Looks like spring, glad of it. 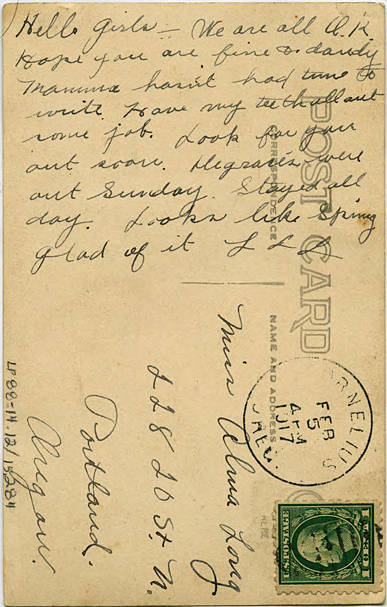 L. L. L. [postmark] Cornelius, Feb 5, 4 P M 1917. Oregon.